American Bible Society – Society established in 1816 to ensure a Bible was in every American home. Site includes a history of the society and much more. United Bible Society – a world fellowship of Bible societies. Bible Gateway – tools for reading and researching Scripture online, in numerous languages and translations. Undiminished Accuracy of Scriptures – Bible study by Christianity Today on textual criticism and inerrancy. International Society of Bible Collectors – Society of Bible collectors founded in 1964 interested in the background and history of all Bible versions, including their translation, publication, preservation, display and distribution. Internet Bible Catalog – a web-based catalog of printed editions of the Bible, with a primary focus on English language translations, but with many entries for Bibles in the original languages and in non-English versions. The Van Kampen Collection – one of the largest private collection of rare Bibles, scrolls, artifacts, and biblical manuscripts in the world. Website gives good sample of the collection. Library of Congress Bible Collection – the exhibit features the Giant Bible of Mainz and the Gutenberg Bible in the Great Hall of the Library of Congress, as well as sixteen other select Bibles from the Library of Congress’ collection. Mary Baker Eddy Library Historic Bible Collection – First Church of Christ, Scientist is creating an online catalogue for its historic Bible collection. Obligations of the World to the Bible: A Series of Lectures to Young Men, by Gardiner Spring (1839) Christian History Institute – a variety of resources showing Christianity’s influence in the development of world civilization. The Bible Project – a series of animated videos that walk through the narrative of the Bible book-by-book and theme-by-theme. Associates for Biblical Research – demonstrates the historical reliability of the Bible through archaeological research and related apologetic investigation. Biblical Archaeological Society – educates the public about archaeology and the Bible; publishes The Biblical Archaeology Review. Siloam Inscription: An Ancient Architectural Feat & Biblical Verification by Nicholas Van Cleve. Mr. Van Cleve was a sophomore at HBU in 2013 when he won first place in the “Piece of the Past” essay contest in the Dunham Bible Museum category. The Contents and Significance of Egyptian Alabaster Jars by Katie L. Kuhlman; examines an ancient Egyptian jar in the Dunham Bible Museum’s collection. 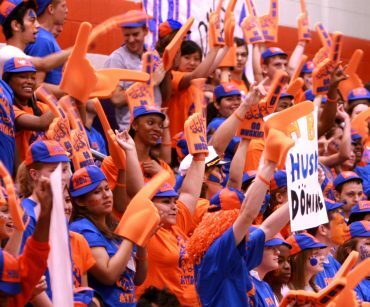 Ms. Kuhlman was a sophomore at HBU in 2012 when she won an honorable mention in the “Piece of the Past” essay contest. Scrolls from the Dead Sea – Library of Congress exhibit on Dead Sea Scrolls. Digital Dead Sea Scrolls – Examine the Dead Sea Scrolls in detail. The Isaiah Scroll, the Community Rule Scroll, the Commentary on Habakkuk scroll, the Temple Scroll and the War Scroll are online for careful examination. Includes videos and explanatory notes. Center for the Study of New Testament Manuscripts – Center devoted to electronically recording every known New Testament manuscript for textual study and analysis. Interpreting ancient manuscripts – Contains information on paleography, manuscript transmission, textual criticism, and more. Tischendorf and Codex Sinaiticus – Tischendorf’s own account of the discovery of the important 4th century manuscript. Aleppo Codex – the oldest and most complete Hebrew Bible. Website includes history, transmission, and digital online version. Codex Sinaiticus – one of the earliest Bibles, from the 4th century. The British Library owns the major portion of the Codex. Codex Sinaiticus Project – gives history of the manuscript, the manuscript online, and news of the manuscript. A cooperative project of the British Library,the National Library of Russia, St. Catherine;s Monastery, and Leipzig University Library. Codex Alexandrinus – one of the 3 earliest manuscripts of the entire Bible in Greek. Jerome and the Vulgate – more on Jerome’s 4th century Latin translation. Syriac Bible from the 5th century. A Story of Remarkable Recovery by Nicholas Van Cleve examines the history and significance of a scroll of the book of Exodus from the Cairo Genizeh. 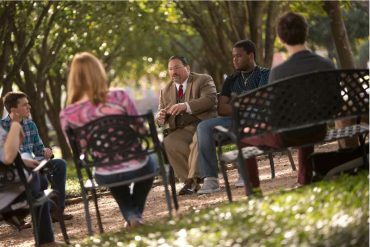 Mr. Van Cleve was a freshman Honors College student when he won first place for this essay in the 2012 “Piece of the Past” essay contest at HBU. Lindisfarne Gospels – visit the British Library and turn the pages of the Lindsfarne Gospels. St. Cuthbert Gospel – this manuscript is the oldest intact European book with a fascinating history beginning in the 7th century. Purchased by the British Library in 2012 for $14.3 million, the manuscript has been digitized and made available online. Old English Hexateuch – earliest copy in English of part of the Old Testament, with over 400 illustrations, 11th century. Luttrell Psalter – richly painted and embellished Psalter from the 14th century. The Saint John’s Bible – illuminated, handwritten Bible produced in the 21st century for Saint John’s University, using techniques of medieval scribes. Illuminating the Word: The Saint John’s Bible at the Library of Congress – exhibition devoted to the illuminated, handwritten Bible commissioned by Saint John’s University and Abbey in Minnesota. 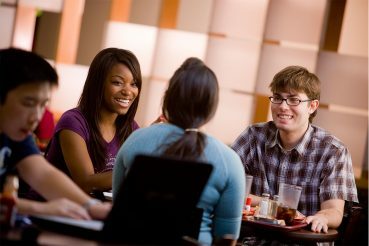 Tyndale House – Christian study center in Cambridge, England dedicated to researching all the primary evidence relevant to the study of the Bible. Includes many online sources as well as references to further study materials on early manuscripts and Christian evidences. Gutenberg Bible – Site 1 – copy at the University of Texas’ Ransom Center. Gutenberg Bible – Site 2 – turn the pages of the British Library’s Gutenberg Bible; also compare the Library’s two editions. Invention and History of the Printing Press -explores life before the printing press, the inspiration and invention of the printing press, how the printing press works, and the impact of the printing press. Erasmus – background on scholar who first printed Greek New Testament. Martin Luther – Site 1 – Bible Researchers’ information on Luther. Martin Luther – Site 2 – Selection of Luther’s works. Tyndale’s Ploughboy – features biographies of the Reformers, history of the English Bible, as well as encouragement to read and study the Bible. English Bible – dealer in antique Bibles includes historical background for many Bibles, including a timeline of the English Bible. John Wycliffe – Site 1 – Wycliffe biography and paintings. John Wycliffe – Site 2 – Wycliffe biography. Wycliffe/Purvey New Testament in modern spelling. 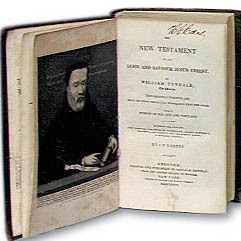 William Tyndale’s New Testament – British Library’s edition of the first printed New Testament in English, translated from the Greek. Tyndale’s translation of the book of Job. William Tyndale – includes Foxe’s account of Tyndale’s life and selections from Tyndale’s writings. 1599 Geneva Bible – Read the Bible read by the Pilgrims and Puritans. Earliest Known Draft of the King James Bible – at Cambridge University Library Special Collections and now digitized and online. 2011 Trust – website for the celebration of the 400th anniversary of the King James Bible. Includes list of events, history, videos, and more. Douay Bible – site devoted to the important Catholic translation of the Bible. Inspirational Highlights of the Bible in America– recounts stories of the early Bibles in America, by Jerry Wiles. Pennsylvania Bible Society – first Bible society in America, founded in 1808, continues to provide Bibles as well encourage the reading of the Scriptures. Thomas Jefferson’s Bible – tells history behind Smithsonian’s restoration of “Thomas Jefferson’s Bible”. A digitized copy can be found at the Smithsonian website. Letters of John Quincy Adams, to his son on the Bible and its Teachings (1848). Uncle Tom’s Cabin – Bible quotes in this most important of American novels. Presidential Inaugurations – List of Bible passages used in the various Presidential inaugurations. “May This Keep You Safe from Harm”: Captain James Scott Cummings’s New Testament Heart-Shield Bible by Bethany Lindell. In 2013, Ms. Lindell won second place in HBU’s “Piece of the Past” essay contest in the Dunham Bible Museum category. Apostles of Apollo – the journey of the Bible to the moon and the Apollo space program. Biblical Literacy Project – project committed to the academic study of the Bible, producers of The Bible and its Influence. New England Primer – typescript of the popular colonial schoolbook. A Defense of the Use of the Bible in Schools – Benjamin Rush, signer of the Declaration of Independence writes on the importance of the Bible in the schools. William McGuffey – about Presbyterian minister whose readers, filled with Bible references, were used from 1830’s-1920’s. National Council on Bible Curriculum in Public Schools – encourages the study of the Bible as the foundation document of society, especially through the study of its history and literature. Gustave Dore’ Bible Gallery – devoted to Bible illustrations by the 19th century Alsacian artist. Many of the backdrops for the Dunham Bible Museum’s exhibits are from Gustave Dore’s Bible illustrations. Biblical Art on the Web – an indexed collection of Biblical art which can be searched by artist, biblical text, biblical subject or a word. Introduction to Galatians – River Pointe Church’s introductory video to sermon series on Galatians, illustrated with art from Bibles in the Dunham Bible Museum Collection. The Visual Commentary on Scripture – The “Visual Commentary,” launched by King’s College, London, displays three works of art for each passage of Scripture, accompanied by a commentary on the artwork and Scripture. 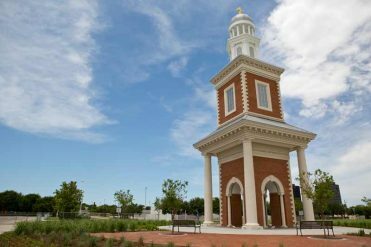 Christian Heritage Museum in Hagerstown, Maryland. Museum of Biblical and Sacred Writings – a public museum, research center, and educational center for the study of ancient historical texts and archaeology in Irvine, California. Museum of the Bible – Major Museum on the Bible, its history and influence opening in Washington D.C. November 2017. Passages is a traveling exhibit from the Green collection (Steve Green, the founder of Hobby Lobby is sponsoring the collection and Museum of the Bible). The Scriptorium – This museum in Orlando, Florida is part of The Holy Land Experience and houses the priceless Van Kampen Collection consisting of several thousand manuscripts, scrolls, and other religious artifacts. The walk-through experience of The Scriptorium transports visitors to historical and geographical areas of the world where displayed biblical documents originated and gives guests a dramatic understanding of the history of the Bible, how it parallels the history of civilization, and the impact it has had upon the world. Manifold Greatness – a special exhibit on the “Creation and Afterlife of the King James Bible”, from collections at the Folger Shakespeare Library, the Bodleian Library at Oxford, and University of Texas’ Ransom Center. A Collection of Bible Museums – Bible Gateway compiled a list with links to Bible Museums throughout the world.